I also really enjoyed that article, Eliza. I was pleased they did not just point out the problem, explain why it is a problem, and then end their article (like the depressing ones we’ve read earlier do). I was also struck by a thread I found running through most of the articles on libraries we read for class today- thinking about libraries as community-oriented, and in terms of their physical space. Almost like books, libraries to me have always represented abstract information I can take, but after reading the articles I thought about what it feels like to be in one. In Alderman, I know I will get work done, but I also know that I will see friends, drink copious cups of coffee, etc. It is not just gleaning information. Even in terms of research- before I really knew how to use online sites like Jstor or even the Carleton library site, I would find where critical books were, and physically browse them. It seems sad to me that we could lose that if books are all kept elsewhere, though I do agree with embracing the physical space and communal significance of a library by removing some of its books. To change topics entirely, I’m interested in how we could make our books an engaging, interactive experience. 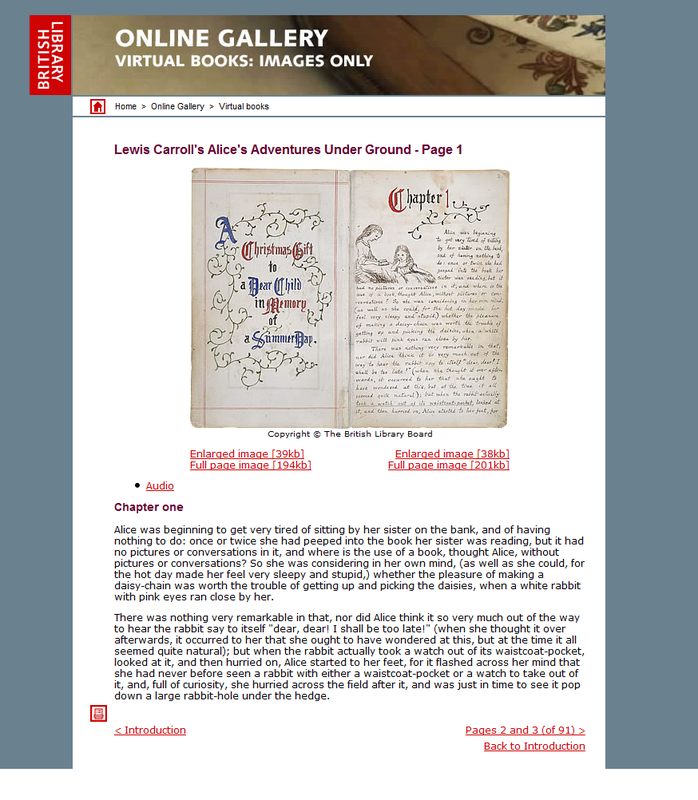 The BL’s site has an excellent introduction to _Alice’s Adventures under Ground_, as well as a virtual version, and even an audio version. The text’s transcription is set underneath the images from the original manuscript. We obviously could not do all of this. So how can we make our objects as interesting on a smaller scale? I think one of our big selling points with these books is how intensely personal some of them are. Though as English grad students we are probably more book-loving than most, the personalities that emerge when we look at the marginalia would (I hope) be interesting to everyone; I’ve told my friends about books I’ve found, and even those in science thought that the notes/drawings/letters were exciting (no offense to the scientists of course, I’m just using them as an example). I think we need to categorize the works no matter what (we just have too many), and I think a way to do this could be to prettily display different groups of what we’ve found. So you could click on drawings, and get to all of them, etc, etc. I’d love to hear you guys’ feedback on this, especially since we’ll all potentially be working on this project soon! I probably should have taken some more time between the end of class and posting this blog, because there is no way that I will not sound like a lovesick teenager about the Cather Archive. It has basically everything that I could want in an archive, with a few exceptions I’ll mention later. The Geographic tool, which maps her world using Google maps and awesomeness. It is excellent that it even tells you what she did in the place she visited. My actual text was “On the Gulls Road“, published in McClure’s Magazine in 1908. The entire story is laid out, and you can access scanned images that edition (or at least, I’m assuming it is that edition). I decided to use the short story and play around with TokenX. TokenX is a really impressive (to me, at least) tool that allows readers to manipulate the tale in many, many ways. You can WordCloud it. You can search for keywords. You can even, for reasons I don’t quite understand, replace all of the words with blocks. I think the tool I liked the best was the Replace Words with Images tool. I think it is a fantastic and innovative way to visualize keywords. I searched “look”, “looked”, “gaze”, and “eyes” (for basically no reason), and got this. I think that is just a really interesting way to think about the frequency of a particular theme (perhaps not in this story, which I know nothing about, but in general). So I had very few problems with this site. I do think that the images they use to replace words could be altered- for example, you can insert a fish but no mouth? And my object-specific problem is that I think ignoring the rest of the magazine the story appeared in is problematic. I do not know much about that specific magazine, but it must be important where the story was placed in the layout, what other stories were chosen, what ads were used in that magazine, etc, etc. I think those questions are crucial to determining how Cather’s own society categorized her writing. That said, I absolutely loved the site. My agony at this not existing for the Alice novels or Emily Bronte is intense. The least surprising thing is that I decided to use this took to look at Emily Bronte’s Wuthering Heights; anyone who knows me knows my dangerous obsession with the novel (as I write this, I’m wearing a “Team Bronte” shirt). So I copied and pasted the entire text from Project Gutenberg into the Voyant tool site. This was a bit tedious since I literally copy/pasted it all- you can use the URL but I did not want all the excess data. The most frequents words were “a”, “the”, etc, so I removed those. These are my final results, and whilst they are not at all groundbreaking (none of us are going to faint away in horror that “Heathcliff” is the most frequently used word in Wuthering Heights), I’m interested in them nonetheless. So to look at my results, we have the names: Heathcliff, Catherine, Linton. To a lesser extent we have Hareton, Edgar, Joseph. We also have a lot of words that have to do with speaking: said, say, replied. That may simply be a result of this being a novel, but I think it speaks to the greater focus on what the characters say to each other in Bronte’s work, and how important it is. We have a lot of master, Miss, Mrs, and Mr, again not entirely surprising but it certainly affirms the focus on status in Bronte’s novel. Who marries whom? Who gets respect? Heathcliff transitions between having one name to being both Mr. and Master Heathcliff. A few intriguing words: father at 102 times. This is pretty interesting- is there a big focus on fatherhood in Wuthering Heights? There certainly is not one on motherhood, all of the Mrs. Earnshaws die pretty quickly (except, hopefully, Cathy II), Cathy II is never really a mother, Isabella is not one. Of course Nelly Dean is a mother figure; though her dubious take on this motherhood (she is pretty wretched to the young Heathcliff and Catherine, she is not allowed to raise Hareton, though she unequivocally attempts to take care of Cathy II). But there is certainly a plethora of father figures: Mr. Earnshaw, Heathcliff himself, Hindley, Hareton, Edgar, Joseph. Another one is eyes. Is there a detailed emphasis on looking in Wuthering Heights? There is certainly a focus on perception, and after double-checking Jstor there are several articles about the novel with “gaze”, “look”, “perception” or “eyes” in the title. I’m interested in hearing your responses to this. Though, as I said, nothing is super groundbreaking, I think it highlights Voyant’s usefulness that I could find these words, and I can analyze them to draw conclusions. I’m also excited to see what the rest of you choose to analyze! How Could the Blake Archive be improved? I was just pondering what could make the Blake Archive better (though, as I’ve said, I love it), and I started to think about the effect of incorporating music into it. Obviously, the music could be muted, but how would we feel about this? Would it somehow be corrupting Blake if we played music whilst reading him, because I confess I listened to Gregorian chant when I read “Marriage”. One has music, images, but almost no words. In another, the creator picks and chooses what words and images to include, but one still gets a sense of Blake’s work. How do we feel about these clips? And how would we feel if the Blake Archive provided music? Eliza mentioned a lack of cohesion- could adding music and perhaps making the pages more “turnable” help with this?